This one of a kind vignette by IGMA artisan Julie Campbell featuring 3 poseable elves and an antique Edwardian ladies boot surrounded by vintage sewing items on a wooden base. 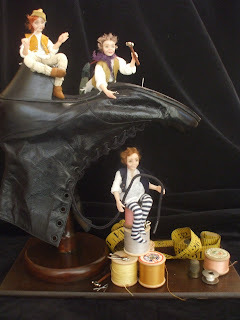 This will be for sale at Kensington Dolls house Festival , 14th 15th and 16th May. Visit Julie's table, Bellabelle Dolls, on the lower ground floor for this and many others.